This post has been awhile in the making, ever since I watched Trigun. Episode 14, to be exact. It chronicles the events of an elder couple who are trying to save their land from being taken by bandits. Eventually, their only son ends up securing their deed at the city hall, making it impossible for the bandits to take the land from them. 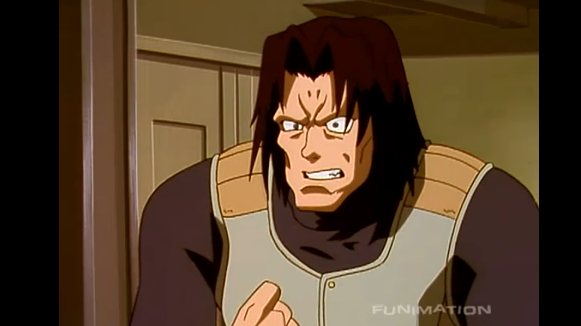 This guy’s name is Badwick. When I saw this guy, I immediately took a screen shot, because the outfit looked strangely familiar. Of course, I knew from exactly where. Vegeta. The similarities are striking. Both of them are wearing a blue-ish shirt with a white vest that has gold, sectioned straps. Badwick’s shirt is more gray, but could be taken as an old dusty blue, which is what I saw when watching it. Dragon Ball Z was released as an anime first, spanning many seasons, and ending in 1996. Trigun was released in 1998. 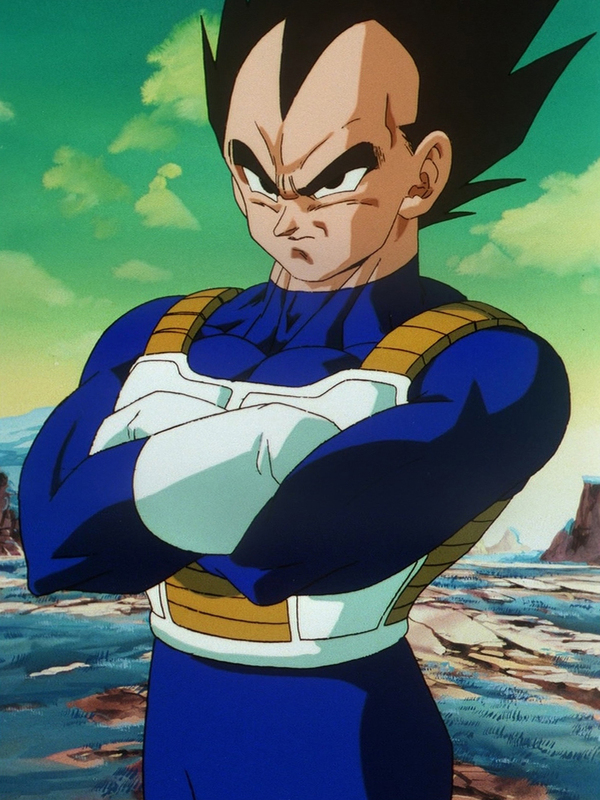 From this timeline, it’s obvious Vegeta is clearly the trend-setter here. 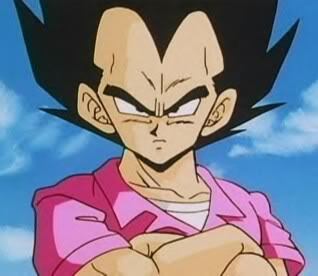 But of course, if you’ve seen Dragon Ball Z, you’d know that Vegeta has always been a trend-setter. Who remembers the pink shirt? Hot right? It’s totally over nine thousand! Here are a collection of AMVs that I stumbled upon in my college years that have been saved in my YouTube favorites. The first is about Dominic and Anemone from Eureka 7, an anime I watched with my room mate quite often during Saturday night anime on Cartoon Network. These two are one of my favorite couples of all time, especially since the torturous life that Anemone was forced to live. This second one is an incredibly well done splicing of two animes: Cowboy Bebop and Trigun. The former is about a gang of bounty hunters, and the latter is about someone with a giant price tag on his head. The combination of the two is absolute genious. This one I loved in college, as I spent most of my time in my first year watching Naruto and Bleach instead of having a social life. I grew out of that, trust me. And I really, really liked Sakura and Sasuke together (and I still do). I truly believe Sakura would sing this song to Sasuke if she could. For those of you who don’t know, Ouran Highschool Host Club is my favorite anime to date. 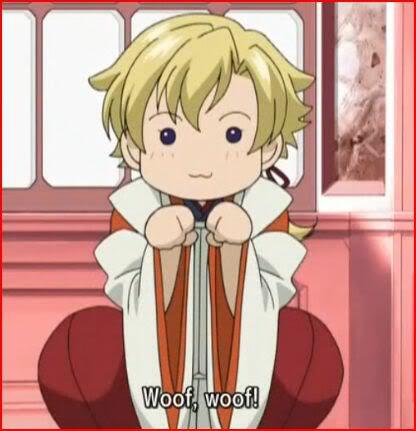 The president of the Host Club is Tamaki Suou. He’s a second year highschool student at the elite Ouran Academy, a school for the children of extremely wealthy families. From the time Haruhi Fujioka, a commoner who gets into Ouran on scholarship, gets mixed up with the Host Club, Tamaki becomes obsessed with learning about and doing things the commoner way. 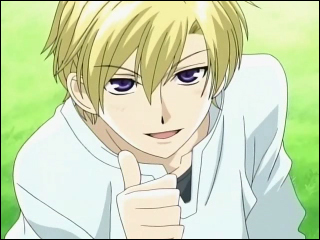 Tamaki is the illegitimate son of Ouran’s chairman to a French woman whom he fell in love with. His father’s family, especially his grandmother, is not fond of Tamaki’s mother and pays her off to have Tamaki live in Japan with his father. As his father has no heir at this point, it was the only choice they had. Part of the deal includes that she never see her son again. Tamaki’s mother is frequently ill, and he agrees with the terms so that his mother can have a comfortable life for herself. Despite his past, Tamaki is an extremely positive and cheerful young man, is genuinely caring and enthusiastic, and has insane piano skills. 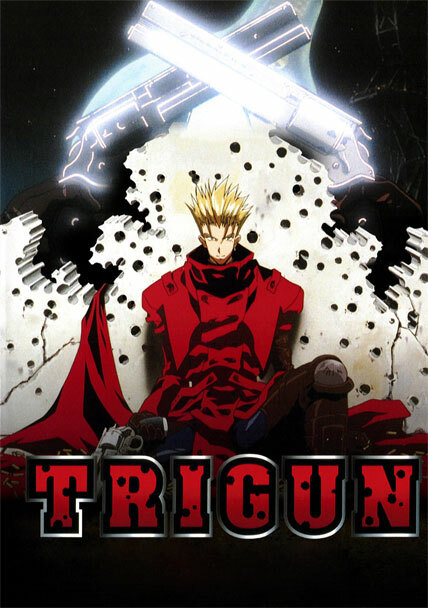 I am almost half way through Trigun, and will probably have it finished here in the next few days. It is quickly becoming one of my top 5 favorite anime, especially after the introduction of Nicholas D. Wolfwood and the shoot out contest episode. Because I don’t know Vash’s full story at this point, this will be short. 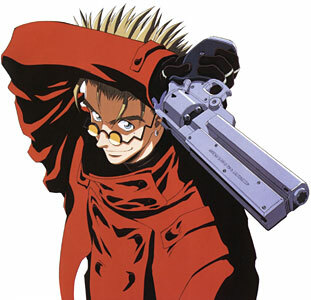 Vash the Stampede is an ace gunman and vigilante for peace and love. Though he has exceptional shooting and dodging abilities, he never shoots to kill. Snuffing out even one human life would mean the end of the world to him. Most often, he appears to be a klutzy goof ball with an infatuation for beautiful women. Most people don’t believe that he’s the renowned gunman with a 60 billion doubledollar (their currency) bounty on his head. But when it gets down to business, he can be super serious. He seems to have a fair bit of a tragic past, and I’m still waiting for it to reveal itself. Now, the whole point of this post is to compare these two. 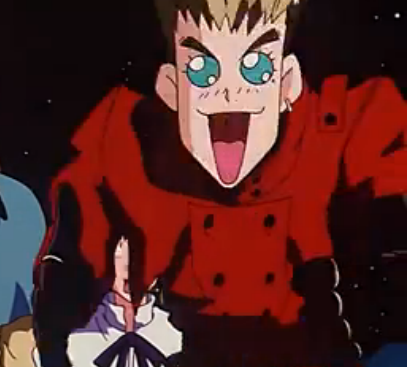 When I was watching episdoe 6, Lost July, of Trigun, I witnessed a scene that made me double take. This chick hired Vash as a body guard, and she says, “come, Spot!” to order him to follow her. Subsequently, he makes a puppy face, barks, and proceeds to follow. Immediately, I thought of Tamaki Suou from Ouran who is know in the Host Club for his infamous puppy face that allows him to get his way. Specifically, he uses it to get the Host Club to get in the same boat about saving the Newspaper Club from being dismantled. As soon as the rest of the Host Club relent, he lets out a loud bark. This got me thinking about how similar these two characters are. For the most part, both characters appear silly and ridiculous and are often chastised for not being or taking things seriously. In reality, both of them are extremely talented, Vash with guns and Tamaki with the piano, and can be very down to earth and serious.They use their talents in these serious situations for the benefit of others and learned their respective talents for selfless reasons. Tamaki initially started playing the piano to keep his ill mother company, while Vash learns to became a gunman to protect others. Despite their tragic pasts, both characters continually look forward. Even though neither of them are my favorite in their respective anime (for obvious reasons, Kyoya wins out in Ouran, while Wolfwood wins in Trigun), their personalities make them very lovable characters whom I hold a great deal of respect for.